Whilst there had been occasional free radio activity in the Republic of Ireland prior to 1970, stations began to come on the air in greater numbers in the early 1970's. At this time most only operated for a couple of hours at a time, usually either late in the evening (in order to broadcast to listeners in Europe) or on a Sunday. The following list of stations were reported to have broadcast from the Dublin area up to 1975. For further information on stations operating during 1972, either click on the individual links above or read a letter from the Winter 1972/3 SIRA Magazine. 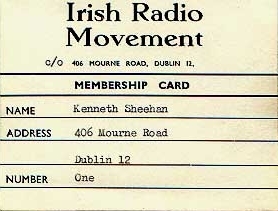 A membership card from the Irish Radio Movement, created in 1973 in an attempt to publicise the fight for free radio in Ireland. This particular card was from founding member Ken Sheehan, who was one of the operators of Radio Dublin at the time.